Product prices and availability are accurate as of 2019-04-14 21:18:31 BST and are subject to change. Any price and availability information displayed on http://www.amazon.co.uk/ at the time of purchase will apply to the purchase of this product. 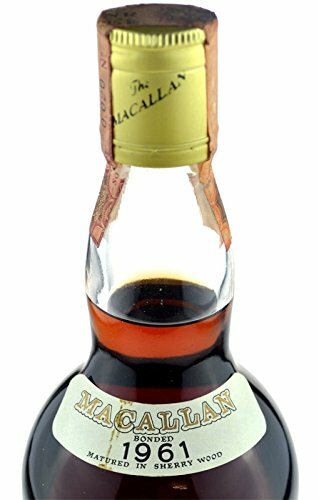 Rarity: The Macallan Whisky Vintage 1961 Sherry Wood original bottling 0.7l (26 2/3 FL.OZS), 45.85% alc./vol. (80° Proof) - matured in Sherry Wood - Pure Highland Malt Scotch Whisky, very rare with colouring Distilled by Macallan-Glenlivet, Ltd. Craigellachie, Scotland, bottled with 80 Proof by Campbell, Hope & King, Elgin. Imported by FLLI Rinaldi Importatori-Bologna, LIC Utif 17. 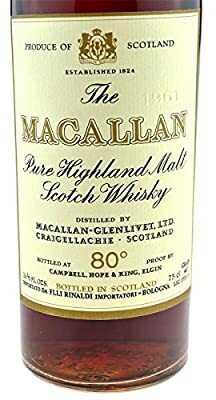 Text on bottom of the bottle: SC 295 - Liquor Bottle Scotland - N 121 - UG. Tax seal number: da litri 3/4 Serie NR - Sottos 0.020 N° 042. The filling-level of the bottle is good. Both labels are in a very good condition. Difference taxation: no sales tax stated according to § 25a sales tax law (UStG). Only one bottle available! It is forbidden to sell bottles with a filling quantity of 750 ml in the EU. Because of that we offer this 0.75l-bottling in 0.7l. For deliveries outside Germany, the customer has to pay the legal national consumption tax, such as for spirits, champagne, wine and beer, himself to the authorities, such as Customs office. The German liquor tax, sparkling wine and beer duty tax was paid by the ALRA Handels GmbH or its suppliers.